Valid Saturday November 28, 2009 only. Buy 1 Get 1 FREE Mother of Pearl Ornament. 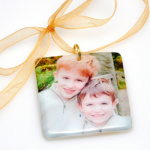 Let your photo shine on this beautiful Mother of Pearl photo ornament. A gorgeous addition to your tree or as a decorative accent any time of year. A perfect gift for Christenings, Weddings, Anniversaries, or just capturing those everyday moments we love to look back on year after year. The Mother of Pearl ornament is single sided and available in 3 shapes and sizes. Please specify when submitting images if you would prefer a gold or silver accent loop and mention any special ribbon color requests.